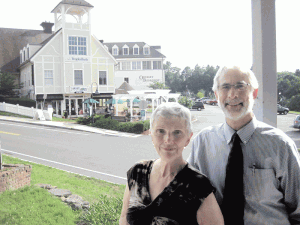 Susan Stockman and Steven Markow say the chamber relies on a support network woven from about 100 mostly small businesses and organizations in the two towns. Steven Markow was talking about life as a small-business owner in a small community. And to make his point about what he liked most about that life, he recalled a recent episode at the supermarket. The business community in South Hadley and neighboring Granby is dominated by such small businesses, he went on, noting that, while this constituency certainly contributes to the social fabric of those towns, it creates challenges, as well as opportunities, for the South Hadley & Granby Chamber of Commerce, which he will serve as president beginning in January. Elaborating, he said that, while the chamber has some larger members — Mount Holyoke College would definitely be in that category — most of the 100 businesses and organizations involved with the chamber would be considered small if not very small. This creates fiscal challenges (dues are set based on overall employment figures) and limitations on overall support for chamber initiatives, he noted, adding that what this chamber lacks in terms of a membership base and large companies, it makes up with imagination, energy, and resourcefulness. For this issue’s Getting Down to Business focus, BusinessWest talked with Stockman and Markow about this support network that has evolved over the years, and how it is integral to the chamber’s efforts to help improve quality of life in South Hadley and Granby. When Stockman retired from Yankee Candle in the fall of 2005, it took less than four months, even through the typically busy holiday season, for her to realize that full days of downtime were not for her. Her background in corporate communications at the renowned tourist attraction was a good fit for the town of South Hadley, and since the position was only part-time, skills that included effectively communicating business objectives and working with volunteers through past chamber functions were welcomed, said Stockman. But Markow adds that what South Hadley lacks in tourism destinations, it makes up for in the nationally recognized college — Mount Holyoke — and the aforementioned high quality of life and atmosphere that both towns offer. While Granby may be more of an agricultural community, it recently became the new home of the MacDuffie School, a highly respected, private, international boarding high school, which relocated from downtown Springfield. Still, membership has held fairly steady in recent years, despite some losses prompted by the Great Recession. Despite these challenges, the chamber has been able to bring value to members — and help many small businesses mature and grow — by enabling them to make contacts, largely through a host of formal and informal networking events, as well as informational sessions designed to keep them abreast of issues impacting all businesses in the Commonwealth. She offered a recent example of group-effort support: Chris Brunelle, owner of Brunelle’s Marina, offered the Lady Bea vessel (on which the company provides cruises down the Connecticut River) as the venue for a networking cruise event on August 28, which will keep the cost of the event down for members. Stockman is also preparing for a special Beyond Business at the Old Firehouse Museum in September that will honor premier members. But aside from the networking and recognition, Stockman said there are two standout events in the chamber’s educational program: an annual legislative breakfast, which offers members an update on the political landscape from state Rep. John Sciback and state Sen. Stan Rosenberg (who missed this past spring’s event due to cancer treatments); and the annual Economic Forum, now in its sixth year, which features Mount Holyoke College Professor James Hartley. “The Economic Forum is especially well-received due to Jim Hartley, who heads the department of Economics and, in fact, was recently named as one of the best 300 professors in the nation by the Princeton Review,” Stockman told BusinessWest. Indeed, that book, The Best 300 Professors, compiled by the well-regarded Princeton Review, lists no less than 14 Mount Holyoke College professors, more than any college in the Commonwealth listed in that publication. It is through this high caliber of talent within the South Hadley and Granby area, Markow noted — not just from the large businesses like Mount Holyoke College, but from enterprises of all sizes — that the chamber is able to pool support that helps to educate and better the business and personal lives of those in the area, even if they aren’t chamber members. As a final example, Markow mentioned that, even though he doesn’t own a dog, he suggested that the chamber help make possible the creation of a dog park, a concept he says is becoming increasingly popular in towns across the nation, and certainly a act of ‘betterment’ in the community. “Dogs these days, with all the town policies, rarely have a chance to be off-leash, and while we can’t take this all on ourselves, we’ll help to facilitate and get it going,” he said. While every program, initiative, or event isn’t exactly a walk in the park, so to speak, Stockman says each effort — small or large and usually group-oriented — is just one more step in the right direction for the chamber and the communities it serves.